To say that I was in the Black Forest, or Schwarzwald, for seven days and I experienced nearly every word in Google’s summary sounds kinda corny, but it’s the truth. I went to a spa. 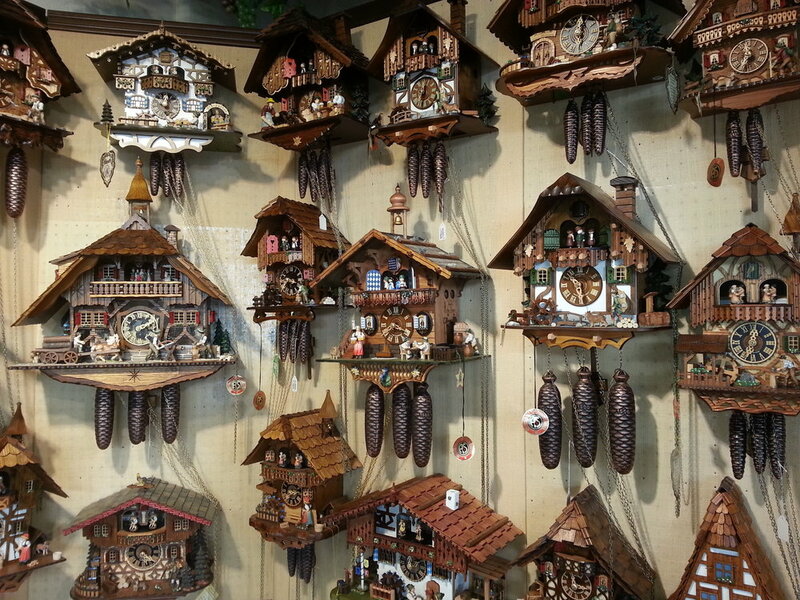 I bought a cuckoo clock. I drank local wine like it was local water. I hiked its second highest mountain, Belchen. I spent a day in Freiburg. I crossed the border into France. And I thought about The Brothers Grimm and their fairytales every single day as we drove through the villages. It was absolutely amazing. Isn’t it funny how google paints a picture of facts but it’s not often colored by experience? I like that. Because experience is subjective. You will see, smell, hear, taste, and feel things in your special way and my senses will capture things in a way that is specific to me. Have you been to the Black Forest? I’d love to know about your time there in the comments below. Before my trip I had only heard about The Black Forest. My dear friend Casondra’s husband Thomas is from there. And honestly, until they met and she told me about him 15 or 16 years ago, I never knew about the place at all. You’re thinking about Black Forest cake, right? I did too! Cherries and chocolate in cake form was all I knew. But I also knew that German chocolate cake was not really a German dessert, so I didn’t really ever think about an ACTUAL forest. My friends, Schwarzwald is not just a wooded area or like The Red Wood Forest that we know. It is 99 miles long and 2,320 square miles of actual forest and villages. If my math is right, that is 101 times the size of the island of Manhattan. So yeah, not just a little wooded area that might have cake. We stayed with Thomas’s parents, Fridolin and Erna Asal, in his childhood home that the family used to run as a bed and breakfast. Fridolin and Erna didn’t speak any English and I continually spoke the only German word I truly felt and could confidently say: danke, or thank you. It was such a treat to be welcomed into the Asal home. We spread his mother Erna’s homemade jam on rolls every morning along with honey from the Black Forest, we ate speck from their cellar, and I even got to sample their schnapps! One of the highlights of my time in Schwarzwald was coming home from our day’s adventure and sitting in the living room all together. Many German restaurants, guest houses, and homes are heated with a kachelhofen. (The Asals speak in the dialect specific to Schwarzwald which is Allemannisch and it is called a Chunscht which sounds like “hoonch.”) It’s a wood burning tiled stove with seats around it! It makes the whole room cozy and a very welcoming gathering space. And yes, I let myself imagine the threat of Hansel and Gretl being shoved into the witch’s stove! Those evenings Thomas would visit with his parents while they watched the news and Casondra and I would play cards and drink wine. I didn’t understand a word being spoken on the television, nor any of the words exchanged by the Asals. And yet I felt at ease and welcomed. Sometimes sitting in silence and soaking up the sights and sounds around you is the best way to experience new things. This is a Chunscht from a restaurant where we had dinner one night. Somehow I missed taking a photo of the one in the Asal home. Theirs had brown tile. We told Stefan’s wife Eva that I had a food blog and we were looking for an authentic German recipe for me to take home. I asked about Black Forest Cake but she said she didn’t have a recipe. She left the room and came back with her family recipe for Linzertorte. How sweet. I couldn’t wait to make it. The night before we left, Eva’s mother Gisela had taken the time to make us a linzertorte and had dropped it off at the Asals! Isn’t it beautiful? So thoughtful. So generous. We gathered around the Chunscht and gobbled it up. Thomas translated the recipe (I put my adjustments in parenthesis down below) and I’ve made it here in my Harlem kitchen to share with my loved ones. My trip to Germany included days in France, Switzerland, and the Netherlands. My friends planned the perfect itinerary and were incredibly gracious hosts. Visits to Europe are always remarkable. But the Black Forest is a place that will stay with me forever. It fed my senses, my imagination, my heart, but especially my soul. And here’s something that fed my tastebuds! 1. Preheat the oven to 345 degrees. Mix the ingredients, put the dough in a cool place, but not the fridge. 3. Bake for 45 minutes, Let cool before slicing to let the jam set.